This is the recipe for a healthy, nutritious, delicious and spicy dosa. Idli/dosa is every South Indian’s favorite breakfast dish and there must be hundreds of varieties of dosa. My mother used to make this dosa for me when I was a kid. The whole kitchen filled up with an aroma when she made this dosa. I have not added egg to this dosa batter since I do not eat egg these days. Eggs will give it a nice color and more taste. I shall update the picture if I make this dosa adding eggs. 1. Soak the idli rice, urad dal, black chickpeas, green gram and peanuts for around 2 hrs. 2. Grind them with 2-3 green chillies to a coarse paste. Keep aside for around 1 hour. There is no need to ferment this dosa batter. Just before making dosa, add enough salt, chopped curry leaves, chopped cilantro, cumin seeds, hing, chopped green chillies, chopped pearl onion, egg (optional) and mix well. Make the dosa and serve hot with chutney. You won’t get crispy dosa with this batter but its tasty and healthy as well. Grind the grated coconut, pearl onion, ginger, green chillies, curry leaves and salt in a mixer. While grinding you can add water if needed. In a pan heat some coconut oil and splutter mustard seeds. Add dry red chillies, chopped pearl onions and brown them. Add the curry leaves and pour the ground coconut mixture to this and heat through. Check for salt and switch off. Sending this recipe to MLLA21 hostel by Mirch Masala and started by The Well-Seasoned Cook. 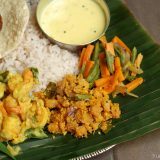 We are also sending this recipe to JIHVA – Breakfast hosted by Veggie Platters and started by Mahanandi. 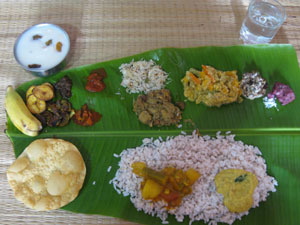 Also sending our vattayappam recipe and spinach, beetroot, carrot chapati recipe to JIHVA – Breakfast. I should say this one is the unusual kind of multi legume dosas. I was expecting to see the adais. Thanks for the yummy entries and your participation. Wow! very delicious and healthy dosa…shall I take those dosas for my dinner? Btw, I love the colorful chappathis too..
Hello Maya/Lakshmi… thanks for dropping by at my blog and leaving your comments. Honestly, I have to slowly go throu all your recipes, seems I ‘ve a whole lot of unique recipes to explore here.. You have such a creativity and I love all your recipes, the steamed rice cake is tempting me too much, I’m bookmarking it. No words about this unusual dosa too.. very inviting! I love any kind of dosa. We do similar kind of dosa with multi legume named Adai accompanied with Avial. With Coconut chutney dosa looks inviting !! Hi Maya/Lakshmi thank you for your lovely comment in my blog.. Dosa looks so delicious and different never tried this type of dosas will try soon.. Colorful chapatis dear..
Wow, such an healthy and delicious dosa, will definitely try it. Your chapathi’s are mind blowing. You both are really creative. Such a healthy dosa to enjoy, that colourful chappathis attracts me a lot..yumm!! Thanks for visiting my blog dear..u have so many colour recipes here..will follow u. Looks so beautiful.. i love u r colourful chappati..
chick pea cherthu njan dosa undakkiyittilla kto..adipoli ayittundu..gotta try this version..and my fav chutney too….looks so yummy!! Wow very healthy Dosa..and so many nice recipes for the event..
Dear Maya and Lakshmi..what a beautiful space you have here. So glad could be here to check out ur awesome and mouth watering recipes. This is my 1st time here and I’m loving it…Thanks for ur kind words on my blog..and I’m glad you stopped by so I cd visit this Yummy O YUmmy space and will be visiting you regularly. LOved reading abt you both in the previous post(the honest things..). Lovely delights there…first time here…the legume dosa looks good and very nutritious. is different. is special. is a must try. thank u so much,my hubby and kids loved this dosa,i tried other recipes also,all came out well. Maya, ee dosa batter undakki fridgil vaykkunathu Kondu kuzhappam undo. I want to try this dosa.